Hagen Music: New from Hagen Music: "Sainthood (聖徒身分)"
New from Hagen Music: "Sainthood (聖徒身分)"
"On the Steps of St. Paul's Cathedral"
We’ll all go home again. Yes, we’ll all go home again. Originally titled "The Impossibility of Sainthood," this song is another which has taken a long time to develop into its full fruition. The music originated with a piano piece which originated with a guitar piece going back to the mid-90s(!). The lyrics were first written in 2001 apart from the third verse. The song had already been given the title mentioned above, so it should be no surprise that the last verse came to mind after I had finished reading St. John of the Cross' "Dark Night of the Soul" in 2006. The music, notably the harmonic modulation of the bridge, was completed around the same time. After recording this version almost entirely with the use of midi, the song came to sit much more profoundly in a modern context. (You can here an original version here.) Saints are not people that we come into contact with much in this day and age, nor is it easy to live a monastic life surrounded as we are by ever-expanding technology. The art which graces the song therefore was, in turn, inspired by the new recording. 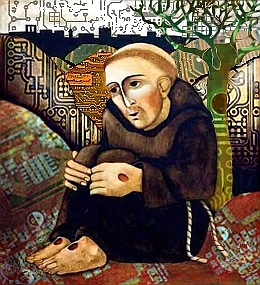 I don't know where the original painting comes from or who painted it, but I adapted it so that the figure - St. Francis of Assisi, a favorite saint of mine - was now in a world in which everything consisted of circuitry, even the sky. So, is this the Electric Monk, or does he come next? The other accompanying images were developed from my own photos. "The March of the Penitent"